Sitting Frog on Grass / Leaf - "I'm not a diva. I'm a tadpole trying to be a frog." Frog...sitting frog on grass / leaf garden sculpture will be sure to add whimsy indoors or in the garden. Not just any frog, this rusted metal sitting frog on grass / leaf garden sculpture is designed by renowned Arizona metal garden sculptor Henry Dupere. 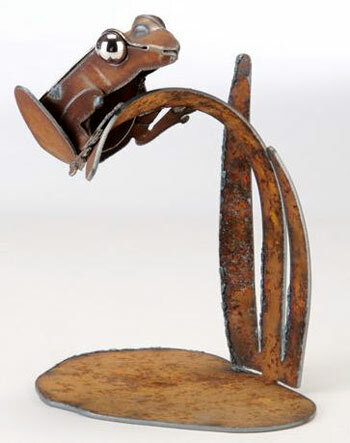 Henry Dupere Sitting Frog On Grass / Leaf Metal Garden Sculpture. Three-dimensional rusted Frog metal garden sculpture.